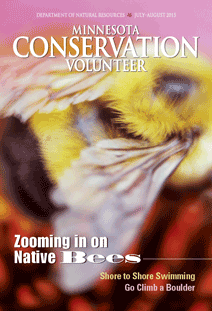 The Minnesota Conservation Volunteer published (Jul/Aug 2015 issue) a feature article on the Minnesota Biological Survey's grassland bee surveys. Wild bees provide vital pollination services and are an integral component of biodiversity. Concerns over declining pollinators, combined with loss of native habitats and other threats to ecosystems in Minnesota led to an initiative to develop a list of bee species in the state. It's important to record what bee species live in Minnesota and which habitats they prefer so we can practice effective pollinator conservation. To support this work, the Minnesota Biological Survey applied to the Legislative-Citizen Commission on Minnesota Resources for a grant from the Environment and Natural Resources Trust Fund. This project began July 1, 2014 and is ongoing. The Minnesota Wild Bee Surveys project has produced a preliminary state species list of Minnesota bees, containing over 400 species. The list will continue to be updated as surveys are completed and specimen identifications are confirmed. This instructional video explains how and why statewide bee surveys have been conducted. Why are wild bees in peril? The health of our wild bee population is uncertain. We know very little about the diversity and distribution of wild bees in Minnesota. Research elsewhere suggests that wild bees have suffered serious declines as habitat loss and pesticide use have accelerated. Successful enhancement of pollinator habitat depends on baseline data about our wild bees. Field staff with the Minnesota Biological Survey will set pan traps along transects at sites across the Prairie Parkland Province and the Tallgrass Aspen Parklands Province. Although our knowledge is improving about the diversity and distribution of Minnesota’s bees, large gaps still exist. This project builds upon the initial ENRTF-funded grant (ML14-5(i) Wild Bee Pollinator Surveys in Prairie-Grassland Habitats. It will expand surveys into the Eastern Broadleaf Forest in central and southeastern Minnesota. Field staff with the Minnesota Biological Survey sampled bees at sites across the Prairie Parkland Provinceand the Tallgrass Aspen Parklands Province.